As much as I’ve recently taken to brazenly using our worldwide number one ranking on Google for ‘Marketing Services Provider‘ to grab attention and demonstrate our prowess in search engine optimisation (SEO) techniques, it can be said that Mulberry Square has been and continues to be an ambitious yet modest and pretty low profile business that is proud of the traditional values it holds dear. We are tucked away in what some would say is an understated, higgledy piggledy, listed building where our clients always take precedence over our own ambitions but after barely three and a half hours sleep due to a proposal deadline I had to meet, this morning I joined our five apprentices in welcoming Loughborough member of parliament Nicky Morgan MP to our Mountsorrel HQ. It seems that the print industry is settling into two camps at the moment: those who diversify their offering and those who don’t. It’s become such a talking point that one of the keynote speakers at Pira International’s recent Global Print Markets event made it the crux of his speech. The diversification route seems to be popular with litho print becoming just one of many strings to the bow of many print companies. As a marketing services provider, Mulberry Square is a good example of how this can be successfully achieved. 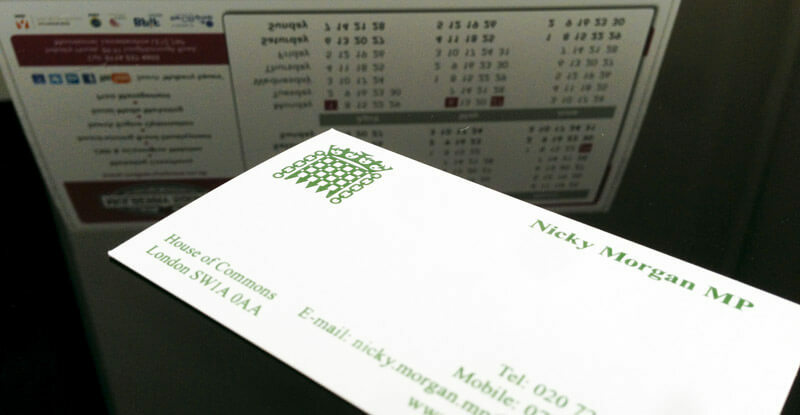 By expanding out from just print into areas such as design, branding, eCommerce, marketing support and print management, the client relationship becomes more involved over a wider area of interaction and the printing company becomes more of a marketing partner than just someone to buy cards and letterheads from. However, the specialist approach is where many print companies see the future. A niche approach gives the print company greater efficiencies, specialist knowledge and expertise which can be hard to find elsewhere. As a result of this, specialist print suppliers can and should give better customer service (and in most cases better value for money) through offering high-level advice and support that general printers may be unable to give. Both directions have merit (and benefits to clients) and it’s up to the respective print companies to show their clients how they can more effectively and efficiently support their business. The British Printing Industries Federation has recognised these two distinct directions and has reacted by offering more advice, support and training for these two key strategic approaches. So, Dr Davis’ urge to become “better, not bigger” has already become a key facet of the wider printing industry’s business philosophy. Paper’s a fairly every day commodity and the rising price means a major impact on many businesses, not least for printers. The cost of paper for a print job is usually in the range of 30% – 60% of the total so paper price rises –which for many people take effect this week – are pretty significant. As a marketing business specialising in print management we buy paper from two main sources: our print suppliers and our office supplies. It’s usually more topical to talk about rising fuel prices rather than paper, mainly because fuel amounts to as much as 35% of overheads for businesses that have to transport goods by road. So if you’re in the paper business at the moment, rising prices would seem to be even more of a major cause for concern. According to the British Print Industries Federation (BPIF) paper prices have continued to increase since early 2010, against a backdrop of increased demand and a continued tightening of paper supply. The UK print industry is the world’s fifth largest producer of printed products and has a turnover in excess of £14bn. There are more than 10,000 companies employing around 140,000 people. Several price rises have affected almost all printers sometime over the past 18 months. The overall levels of price hikes have been quite considerable for the majority. The problem for printers is balancing how many of the rises they can absorb and how many they can pass on to customers. Compared with 2009, prices have risen by around 30%. Now another hike is about to take its toll and a Leicestershire printer told my colleague that, once again, the rise is going to have to be passed on to the customer. He said that paper mills have explained that rising prices are due to changes in supply and demand conditions around the world. These changing conditions can be caused by a number of factors, including economic, political, meteorological, or geological. Add to that the rising price of oil and there’s only one direction the price can go. But our printer also said that paper prices were on the rise before oil prices escalated and there was a view that paper prices were lower that they should be. So one suspects the truth lies somewhere amid global crises, rising oil prices, economic uncertainty, natural disasters, and business opportunity. There’s so much you can blame, it’s probably a good opportunity to add a few pence to the price; probably too good an opportunity to miss. Last week at the office, we received our March/April 2011 edition of the BPiF official magazine, inprint. BPiF prides itself on working with green marketing campaigns, which is always a good thing. However, as we have discovered here, this only works if companies keep their data up to date. In an office of 5 employees, we received a total of 6 identical magazines, one of which had no addressee and two of which were for employees who haven’t worked here for almost a year. The costs involved in BPiF printing and posting all of these extra copies of their magazine must be pretty significant if you assume that other offices around the country have the same problem with extra copies. A quick phone call from us was all it took to tell BPiF of their error, but wouldn’t it make more sense both in terms of customer engagement and clean data for BPiF to make more effort to ensure their data is correct? Although I’ve talked about BPiF here as an illustration, I can only imagine that many many companies have the same issues! Here at Mulberry Square, our marketing consultancy services place absolute priority on commissioning a data audit for new clients. This ensures that their data is clean, up to date and therefore any marketing strategy that we subsequently implement is as cost effective and efficient as possible. The UK print and publishing company, St Ives, have sold their web (magazine printing) division for £20 million to the private equity firm, Walstead Investments. The division is responsible for producing major titles such as the Economist and Time Out, and its capture represents a huge leap forward in terms of market share for Walstead Investments who already own the Wyndeham Group, another large UK print manufacturing company. So what is it that has prompted such polarised moves? Two companies from similar backgrounds, both subject to the same market developments, but while one aggressively swallows market share to consolidate its position as a traditional manufacturer, the other makes a rapid shift towards a leaner, meaner service based operation. Clearly an exchange of this magnitude indicates bold strategic measures for both parties, and one only has to take a glance at their respective websites to understand the logic. On the one hand Wyndeham refer to themselves as the “UK’s Print Powerhouse”, while conversely St Ives speak of providing “complex solutions and added value services”. Naturally both companies are being extremely positive about their decisions, but for a more objective take one needs only review the market reaction; the news immediately shot St Ives shares up 9%, suggesting the broader audience approves of the decision to strengthen the balance sheet and refocus on higher margin areas, such as marketing and logistics. As for Walstead, well you have to admire their determined attempt to consolidate their position as turnaround specialists in an ever shrinking market, but one can’t help but sense the smart money has already spoken. Tired of seeing people selling low quality business cards for high prices? Loughborough based marketing services provider Mulberry Square is proud to have recently launched a brand new website dedicated to high quality and excellent value business cards! The site will only ever do limited edition runs so make sure you check the site regularly, or follow us on Twitter for all the latest information. All of our cards are printed to the highest quality and start from only £33 + VAT plus free delivery so please take a look and don’t miss out on this great offer. Buy your high quality business cards online at our e-commerce website now! The highly regarded and popular clothing label, FLY53 have been busy working on their Autumn/Winter catalogue ready for the new season and, of course, they needed the best around to handle the print management – us! The catalogue is half menswear and half womenswear, with the direction in which you hold it determining which you are looking at, making it both interesting and compact in its design. We handled the print management of this big project, making sure that the paper was the correct quality and finish and of course making sure that the colours in the catalogue match up to the product colours. As you will appreciate, colour consistency between advertising and product is crucial!